Again, I decided that one of my responses to the Ecuador Expats Group was appropriate for this blog. I hope you agree. Why does this continue to be on the forum? Okay. I get it. The person doesn't like Ecuador. Can't put up with trash, public urination (though I have yet to see someone do it when they're facing me - and it's always on the grass), crime, rude people, people who don't wait patiently in lines, bad drivers, etc. That's fine. That's the person's prerogative. The information is good for people who are thinking about relocating to Ecuador so they can make a more informed decision. But, this has been going back and forth for at least a week, probably much longer, and its value has plummeted. Time for the person to just pack up and quietly find their paradise. I'm on a visit to the U.S. right now. I like the highways, the variety of foods, the houses without perimeter walls, government efficiency, visiting family and friends, being able to understand what a minister is saying in church, having more confidence in the doctors, being able to find what I want when I go shopping, having good barbecue, great cajun food, and a good donut when I feel like it. I like all those things and much more. I also miss Ecuador though I've only been here one of four weeks so far. I miss the people we live with and their extended family. I miss the people of FEDICE, the organization we volunteer for. I miss the spectacular beauties of the Andes. I miss the feeling of accomplishment when we successfully navigate "bad drivers" to drive from Otavalo to Quito and back. I miss people selling all kinds of things on the streets, being able to eke out livings because the government does not often demand this or that license. I miss people of all ages walking on the sidewalks. I do not miss the graffiti (which, surprisingly, I haven't seen lambasted in this thread) or the trash, but that's more because of my aesthetic tastes. If I summed it up in a word, I'd say Ecuador was "non-sterile" as opposed to the U.S. The U.S. has become so sterilized that many people think the government should take care of all their needs, from the mundane to the truly horrific. To these people, personal responsibility and consequences are alien concepts. We now know that if we sanitize things too much, we encourage evolution of bacteria that can kill us. Give me "non-sterile" any day (to a point, of course.) It makes life much more interesting. We went to Ecuador to volunteer for one year. We stayed (three years so far) because we liked the people, we liked the beauty, and the cost of living was relatively cheap. Do we see racism and rudeness and inefficiency and laziness? Of course, we do, as we see them in the U.S. We see all of the things covered by the complaints in this thread, and even more, that we don't like. Do we understand the culture? Not always, which reminds us we need to restrain the you-should-do-it-this-way's. For instance, I used to get irritated that Ecuadorian friends would spend all their money instead of putting some in banks for a "rainy day" - until I learned that the culture breeds a healthy distrust of banks. Of course, past history justifies that distrust. When we do move back to the U.S., it will be because we think our lives will be better in the U.S. (think healthcare). It won't be because we don't like things about Ecuador. Ecuador is what it is. We can do things the way we want to do them in our house, and share our methods with others. Besides that, we have no desire to try to sanitize another culture. Great to hear from you, Robert. We've missed you, too. I know you realize that people in Ecuador and South America in general would love to have things the U.S. has, but I would say that the ability to enjoy life, family, and friends is higher here than in the U.S. In my opinion, having a "today" mindset contributes greatly to that. Maybe it shouldn't bother me much when I perceive a lack of planning. But I'm from the U.S. and old habits are hard to break, especially at 64! So good to read your recent post, Glenn. We can identify with your comments. Although our personal experiences are different and our reasons for being expats may not be the same, we do share some of your views of living in a Third World culture. We, too, often hear other expats complaints about our corner of the world (Africa). Many are the same as those in Ecuador, but we can add a few choice ones of our own! That said, I personally feel called to be where we are. At times I can see/feel confirmation of my purpose, other times are a mystery to me, maybe to add a small contribution to someone else's life plan. God only knows! As for us, we are sticking with this expat life for the joys and the challenges it brings. 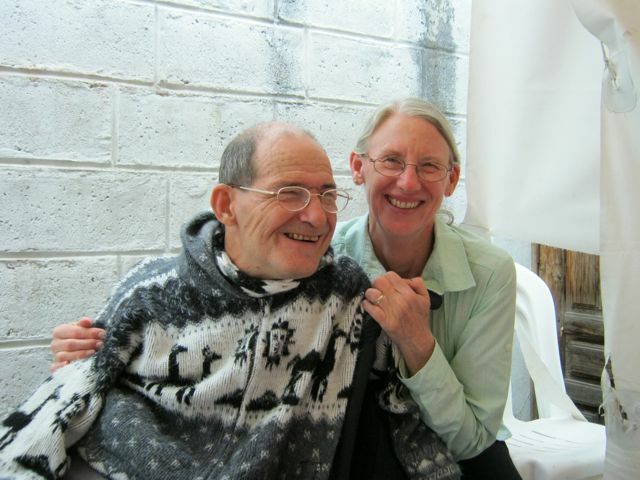 So glad that you two are continuing to do a good work in Ecuador. Hope to see you one day before long! I also hope that we'll see each other again. You and Bill are two of our favorite people. Can't imagine when that might be, since we live in different countries. I really wanted to visit Australia while you were there, but circumstance didn't allow it. Maybe we'll have to keep each other informed of when we'll be visiting the US to see if any visits overlap.